The "Keys to Glory" Piano & Organ Orchestrations album spotlights Peggy Duquesnel (piano) and Andre Mayeux (organ) plus a track from the late pianist Steve Hall. Released to commemorate the 100th anniversaries of Veterans' Day and Irving Berlin's "God Bless America," this rousing collection offers a stirring playlist of patriotic classics, American anthems, hymns, folk songs and originals. Peggy Duquesnel is an accomplished pianist, vocalist, composer and arranger with more than a dozen critically acclaimed jazz, pop and inspirational albums in her rich catalogue. She has performed with Dionne Warwick, Pat Boone, Henry Mancini, and Alan Broadbent, and has been showcased by the Auckland Philharmonic, Disney, Roland, Kawai and many others. Peggy served as stadium keyboardist for the Anaheim Angels, the Anaheim Ducks and most recently, the 2018 Paralympics in South Korea. Andre Mayeux is a consummate keyboardist, composer and arranger with over 35 years of professional experience. He has composed and produced music for film, television, commercials, and recordings that are broadcast worldwide. Andre tours as keyboardist with Juice Newton and produces music in his Nashville studio. Peggy and Andre have worked on many productions together since their first collaboration in 2006 with Steve Hall for the "Divine Light" duo piano album project. They are excited about teaming up for this easy listening, light jazz set comprised of many of America's signature songs. 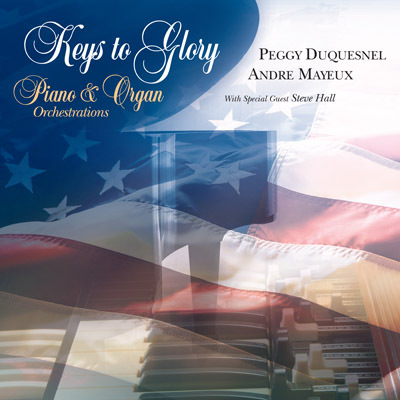 Peggy Duquesnel and Andre Mayeux will drop the inspired "Keys to Glory" on November 9, honoring US Armed Forces and commemorating the centennial anniversary of "God Bless America." 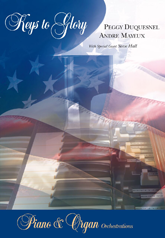 Providing a rally call for national pride and unity for the 100th anniversary celebration of Veterans Day, pianist Peggy Duquesnel and organist Andre Mayeux will release "Keys to Glory" on November 9, a collection of songs of America, patriotic anthems, hymns, folk songs and three originals penned by the keyboardists. Included in the 17-track set produced by the pair is a rousing duet of "God Bless America," to mark the centennial anniversary of the revered Irving Berlin treasure. The Joyspring Music/Bankbeat Productions Inc. release arrives two days prior to the November 11 holiday and serves up over an hour of music, including a medley by the late pianist Steve Hall ("We Gather Together"/"Bless This House"). Titled for a new Duquesnel and Mayeux composition, "Keys to Glory" has been in the works for a few years. Having produced some of the hymns several years ago, the keyboard duo focused on completing the project earlier this year after Duquesnel returned from South Korea where she served as arena organist during the Paralympic hockey games. Since her return, she has been performing regularly at performing arts centers, auditoriums and other venues, including appearances with the Americus Brass Band, a 17-piece ensemble that showcases music from war eras - from the Civil War through World War II - for veterans of the Armed Forces while educating kids about US history. "As a nation, we need to focus more on our shared love of country and our freedom. We want God to bless our country and we need greater unity. Music softens people's hearts. This record promotes more love, freedom, peace and unity in our country. It's important that we pray for the US and our leaders, which is the message behind one of the songs I wrote for the project, 'Beautiful America.' America has always had a deep spiritual component and this album reflects that. We need to bring people back to the core values of this great nation," said Duquesnel, whose father was a World War II veteran. To jumpstart the promotional push for the upcoming album release, Duquesnel has four Southern California dates booked with the Americus Brass Band beginning Saturday night (Sept. 15) in Long Beach, Sunday (Sept. 16) in Lancaster, September 18 in Ripon and September 22 in Ramona. Preorders for "Keys to Glory" are being taken online now, with both physical CDs and digital albums to be delivered before Veterans Day. One could correctly state that "Keys to Glory" encapsulates Duquesnel's accomplished and diverse career that spans acclaimed jazz, inspirational and pop recordings as well as a decade of experience as organist for the Anaheim Angels and the Anaheim Ducks. The Long Beach-based pianist, vocalist, composer and arranger has performed with Dionne Warwick, Pat Boone, Henry Mancini and Alan Broadbent. Her Nashville-based collaborator, Mayeux, has a long history writing and producing music for film, television, commercials and recordings. He tours regularly playing keys in Juice Newton's band.